Russ Button is a San Francisco native. All of his musical talent came from his mother, who played piano and had once been accepted into the Julliard School of Music. His father couldn't carry a tune in a bucket. The first time Russ picked up a mouthpiece and buzzed into it, he was 10 years old, John Glenn had not yet rocketed into space to orbit the Earth, a can of Pepsi cost 10 cents, and new cars did not have seat belts or air conditioning as standard features. Boys didn't play video games. They played outside in the sun (and sometimes the rain). And if they wanted to play an instrument, trumpet was the one they wanted. Russ was no different. Thus began his life-long obsession with music. In the 60's while a student at San Francisco's Lowell High School, Russ played with every kind of group he could find. He was so busy playing in orchestra, concert and game bands, pit orchestra for musicals or brass choir that the 60's almost completely passed him by. As much as he loved music, the music of the 60's just never interested him, let alone the rest of 60's culture. To this day he has still never attended a major rock concert. During his college years, Russ played in every kind of venue you could think of. He played symphony orchestra, concert band, swing big band, musical shows, parades for the Hamms Beer company, brass choir and just about any musical group that wanted a trumpet player. It was at this time that he began his life-long love of swing and big band music. His primary musical influence is the great trumpet player, John Coppola, who once played lead trumpet with the bands of Woody Herman, Stan Kenton, Charlie Barnett and Billy May. Russ called him "The Living Trumpet Master". Russ has been an active band leader and lead trumpet player for decades. Among the bands he's founded are the Royal Court Brass, the Cal Alumni Big Band, and during the late 1990's, he had his own big band called (oddly enough), Russ Button's Swing Orchestra. 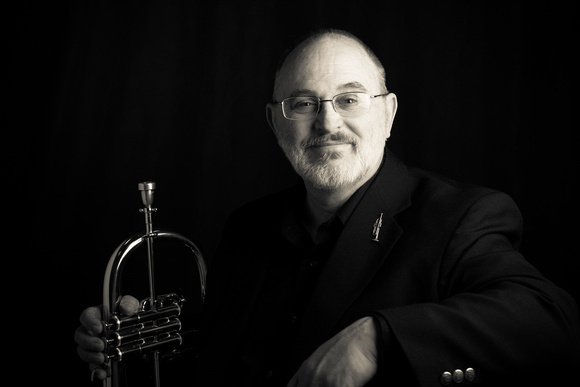 As a serious musician and music lover, Russ has now blended his love for swing, big band, ragtime, Park Band, classical music and jazz with the great energy of brass to bring to you Horns a Plenty. Russ remains a big band trumpet player at heart who's just wild about the music of Duke Ellington and Count Basie, but also has a great love for the music of J.S. Bach. Horns a Plenty concerts are always about discovering something new in every piece. They may play a Sousa march, followed by some big band swing, a Scott Joplin rag and a Bach fugue. The thread that is common throughout is the love of music. Russ believes that one of the greatest blessings of being a life-long musician are the life-long friendships that come with it. Like most life-long players, Russ sees music as a expression and a gift of love to all of life. This isn't simply fun. Music is so much more than that, and he hopes you get that when you listen to Horns a Plenty. Russ lives in a 97 year old bungalow in Alameda with his wife, Katie, (a professional violinist with the San Francisco Ballet Orchestra), and three cats.